Ten minutes out of Lausanne on board a typically punctual train lies a stretch of track that has become a Mecca for wine tourists across the world. Skirting the glacial Lake Geneva (the locals prefer Lac Léman) and with views of Évian-les-Bains and the Alps it winds its way across hillside vineyards to Grandvaux where it passes underground through the “ticket tunnel”, so named because those entering from the German-speaking side of Switzerland are said to have thrown their return tickets out of the window when they saw what beauty lay ahead of them. It’s an enchanting journey. Among the ten Wine Capitals of the World Lausanne is the latest and perhaps lesser known destination. Rioja, Bordeaux, Napa and Porto doubtless spring to mind, but Switzerland? Surely not. But last year the centre of the vineyards of the Swiss canton of Vaud was named as the newest member of the prestigious Great Wine Capitals Global Network, which comprises of ten major global cities in both the northern and southern hemisphere boasting internationally renowned wine regions. It is a nod to a small region that packs a punch, with some 200 varieties of wine produced across 300 vineyards that sit amid an enchanting backdrop. Little is known about Swiss wine outside of the country. In typically Swiss fashion their best exports are kept under lock and key, and so just two per cent of the country’s entire wine production gets shipped abroad despite it being home to viticultural treasures that would be the envy of most countries in the world. But thankfully a new impetus on wine tourism offers a way in, and the most lucrative raids are just months away. Every year in May the 300 cellars that call the canton of Vaud home open their doors to passport-holding wine enthusiasts who, for a small charge, get to rein free among the bounty of vineyards that litter the picturesque slopes of Bonvillars, Chablais, La Côte, Vully, Lavaux and Les Côtes de l’Orbe. The six regions are home to varying terroirs showcasing characteristics that are expressed through honest grape varieties such as chasselas and pinot noir. But if you miss that then you can be thankful that 2019 is a bumper year for wine in Lausanne. The ‘Fête des Vignerons’ will take place from 18 July – 11 August for the first time this Millennium, paying homage to the historic viticultural traditions of the region with a spectacular show and coronation. The outdoor show is held in an arena which is expected to host up to 20,000 spectators, all gathered to attend the celebration en masse. Think Championship-level football for wine lovers – bliss! It would be remiss, however, for any trip to Lausanne to be just about the wine. 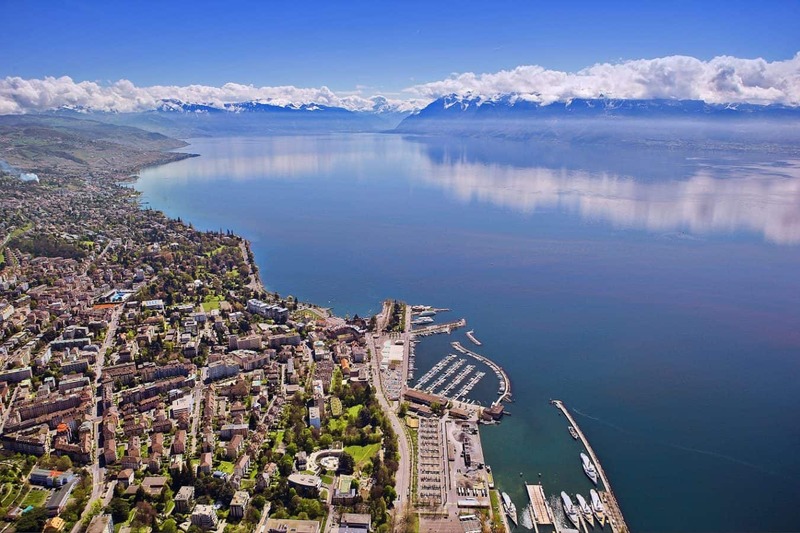 Home to the International Olympic Committee, fascinating museums, curious art galleries, restaurants, bars and a fascinating metro system, here’s a guide to the charming capital of Vaud. The quickest way to reach Lausanne is flying in to Geneva and taking a direct train from the airport. Swiss Air offer flights from £49 out of Heathrow as well as Birmingham and Manchester. From there you will take a 45 minute to an hour train that hugs Lac Léman, dropping you off in the heart of the city. The elevator that leads to the top of the Pont Charles Bessières can be a remarkable ride if timed well. Split over two levels you are greeted at the summit with a piercing red and orange hue that blankets the peaks of the Swiss Alps, with views of the Cathedral of Notre-Dame and the city of Lausanne to boot. Lausanne has a proud Olympic history. Home to the International Olympic Committee, the 2020 Winter Youth Olympics and a museum that spans several floors and many outside acres it is rightly recognised as the Olympic Capital of the World. The museum houses permanent and temporary exhibits relating to sport and the Olympic movement with more than 10,000 artefacts that attract more than 250,000 visitors each year. Collection de l’Art Brut is a fascinating gallery unlike any you are likely to see elsewhere. The works are made by self-taught creators, marginalized in a position of rebellious spirit or impervious to collective norms and values, who create without worrying about criticism of the public or the eyes of others. As the website notes, without the need for recognition or approval, “they design a universe for their own use”. Each Wednesday and Saturday all year long, Lausanne’s traditional market full of colourful stands takes place on the Place de la Riponne and surrounding pedestrian zones, with many quaint roads hosting sellers of seasonal fruits and vegetables, as well as local cheeses, meats and fish. Flowers and handicrafts are also sold in a setting reminiscent of traditional Mediterranean markets. In a nod to the forthcoming 2020 Winter Youth Olympics a festive pop-up heated tent has been erected in the centre of town, with cable cars and a chance to try your hand at beginners’ curling among the activities on offer. Indulge in fondue or a curious local sausage dish that will warm the cockles alongside a good selection of hot and cold drinks. With Alpine views and a fresh glacial breeze Lacustre is a fine place to lazily start the day, offering an enticing selection of world foods and cocktails. Visit from 11am through the week for freshly prepared pizzas, grilled pieces of meat and seasonal salads, with a full brunch available on Sundays. Ta Cave is the first crowdfunded bar in Switzerland, and you can bet that its many owners will be pleased with the outcome. Nestled in a small sloping side street the bar offers a relaxed vibe with cheese and meat boards constantly doing the rounds along with local wine pairings. But the take-home is the fresh bread. La Meule, or “the wheel”, is a pain au levain with a pixelated solid crust that gives way to a fluffy inner bake. It is something that is as unique as it is delicious, and gets served as a sandwich or as tear-and-share platter fodder. Fresh, seasonal and locally-sourced, the food at Café de Grancy gives you a real taste of Lausanne and the surrounding areas. Dishes vary throughout the year, but expect wild mushrooms, salmon and soup to begin followed by a veritable feast of dishes for main course. Quiche sourced from Semsales, Beef carpaccio with black truffle from Périgord and a Lake Geneva terrine with crayfish and smoked trout are among the picks, but you’ll be spoilt for choice. Whatever the time of year, it would be criminal to visit this part of the world and not indulge in a fondue. Pinte Besson – named after oversized servings of wine that were served to thirsty travellers – is the oldest bistro town and serves a traditional fondue as well as an intriguing Morels and Cognac fondue. Classic Alpine ski foods served in the heart of the city. Explore the world on small plates at Eat Me, where you will be treated to a medley of dishes from all four corners. Drawing from “food souvenirs” that the proprietors have collected during their travels the menu reflects everything from the humblest of street foods to the most modern of gastronomic dishes. It is well worth a try. The Royal Savoy Hotel & Spa is a hotel of civic pride, with views overlooking the lake and numerous amenities that will make it hard to leave. Built in 1906 the hotel is famous for its timeless elegance. In late 2015 it was renovated and reopened with a brand new extension which is surrounded by the hotel’s 5,000 m2 grounds. The hotel comprises of 196 rooms and suites as well as meeting rooms, a gourmet restaurant with terrace, a lobby, a cigar lounge and a sky lounge on the rooftop. Its 1,500 m2 spa is the largest of any Swiss hotel.